The Sony Alpha A7 II is a superb camera that has all the benefits of a full-frame sensor without the bulk. It has good AF, superb image stabilization and produces very high quality images in a wide range of conditions. 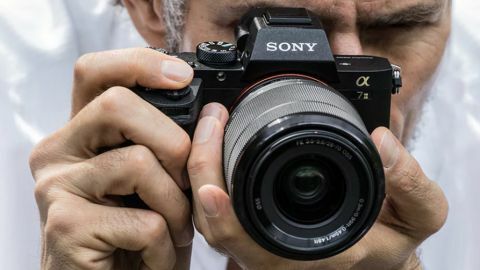 Sony caused a major stir in the photographic world when it introduced the 24MP Alpha A7 and 36MP Alpha A7R, because they were the first mirrorless cameras to have full-frame sensors – the same size as a 35mm film frame. What's more, these two cameras (subsequently joined by the 12MP Sony Alpha A7S) are incredibly small for full-frame cameras, not too dissimilar in size to the Micro Four Thirds Olympus OM-D E-M1, and offer a similar level of control. Now Sony has created new waves of excitement by introducing an update to the A7 in the guise of the Alpha A7 II. However, some may feel that changes are rather small as, like the vast majority of the new camera's components, the sensor is the same full-frame (35.8 x 23.9mm) 24MP Exmor CMOS device as is used in the original Alpha A7. The biggest news about the Alpha A7 II is that it's Sony's first full-frame compact system camera to feature in-body stabilisation. This means that the sensor can move to correct for accidental camera movements during the exposure. This 5-axis in-camera image stabilization may be unlikely to tempt existing A7 users to upgrade, but it does make the new camera more attractive than the older model to new buyers. The stabilization corrects X and Y axis movements as well as pitch, roll and yaw for both still and movie recording. When a stabilised Sony lens is used on the camera the two systems combine to give optimised performance, choosing the best one to use for the focal length and each type of correction. The stabilization effect is optimised, but not cumulative, as one or the other system is used, not both. Helpfully, those using older (or third party) lenses that cannot communicate with the camera can input the focal length manually to use the in-camera stabilization system. It's probably worth reminding ourselves at this point that the Sony A7 series uses Sony's E-mount. This means that these full-frame cameras can accept both full-frame and APS-C format E-mount lenses, but the image size is reduced when APS-C lenses are used. Alpha mount optics made for Sony's DSLRs and SLT cameras can be used via an adaptor. There are also adaptors available to allow Canon and Nikon lenses to be used. Sony has also given the Alpha A7 II some of the video features of the A7S. For example, it can now record in the XAVC S, AVCHD or MP4 format. Plus, there's simultaneous dual format recording in MP4 and XAVC S or MP4 and AVCHD format to provide an easy format for sharing along with data-rich footage for editing. In addition, Picture Profiles offer the ability set the Gamma to Sony's S-Log2 for reduced contrast and greater dynamic range, plus the Time Code feature helps with scene identification and footage syncing from multiple cameras. You can also attach an XLR microphone via an adaptor. On the still images side, the Sony Alpha A7 II supports uncompressed 14-Bit raw image capture. This feature came later into the camera's life by way of the firmware 2.0 update that released on November 18. Before it, the Sony Alpha A7S II and A7R II both supported uncompressed raw shooting. Other specification highlights of the Alpha A7 II include a sensitivity range of ISO 50–25,600, a 0.5-inch 2.4-million dot electronic viewfinder (EVF), a tilt-angle 3-inch 1,228,800-dot LCD screen, a claimed battery life of 350 shots, built-in Wi-Fi connectivity, Near Field Communication (NFC) technology, a maximum continuous shooting rate of 5fps and a standard shape hotshoe with extra contacts to connect accessories like the microphone adaptor mentioned earlier.